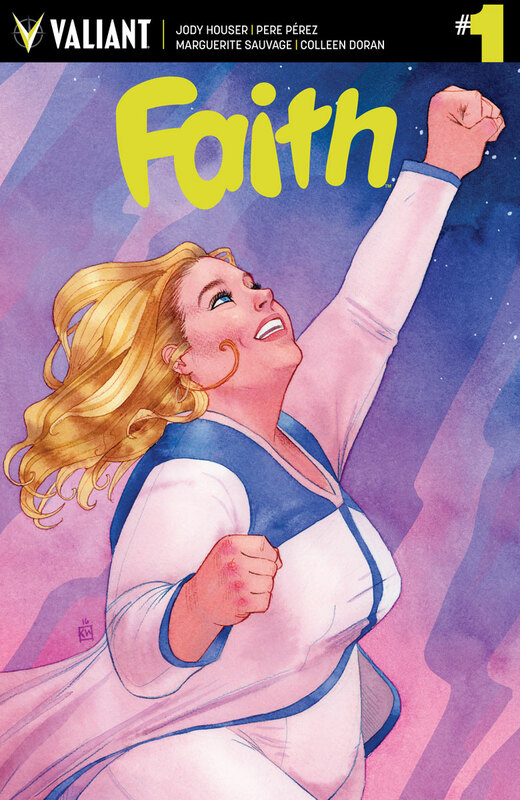 Fresh from her acclaimed limited series, 'Faith' is back in her own ongoing series from Valiant Comics. A lot was made of Faith Herbert's appearance because she doesn't look like other superhero women in comics. What really separates her from comic book tropes is how relatable and likable she is. Think of Peter Parker, Clark Kent, or Kamala Khan and you'll understand the appeal of the charming and funny leading lady. Faith has been through so much already. Writer Jody Houser does a great breezy recap catching up new readers on how she landed in Los Angeles, fell prey to a crazy celebrity cult, dealt with a break-up, got her real identity exposed at work, and how she's dealing with it all. With Faith providing us with her inner monologue we can't help but empathize with her tribulations. She handles it all with humor, confidence, and determination. The daily troubles of Faith is what drives the first issue, watching her trying to keep her alter ego of "Summer Smith" hidden, considering a costume change, playing a D&D-type game, she's the geek-turned-superhero we all dream of becoming. She is us. She loves being a hero and her enthusiasm is infectious. The art doesn't lose a beat as Pere Perez takes over for Francis Portela. It's just as expressive and bold perhaps a little crisper but still immense fun. Andrew Dalhouse's colors are so clean and vibrant he gives each great depth. Marguerite Sauvage continues to create beautiful dream sequences that are smoothly integrated in the story. Those segments delve deep into Faith's inherent optimism and dreams. If you've tired of superhero comics amid reboots and huge convoluted events, then 'Faith' will restore your faith in comics again. It's like reading Spider-Man or Superman for the first time. 'Faith' is fun, exciting, down-to-earth, and must-reading.